We had a great day yesterday on the lump. Pulled up there at about 815 and started chumming and the third bait in the water was an 80 pound yellowfin. Hmm that was a good start. Next bait in the water was an 80 pounder again. I like this. Then we caught a bonito and using it for bait put six more yellowfin in the boat before 1015. We could do no wrong on the lump and we were back at the dock for 1230 with 6 fat yellowfin, one medium fish and one football. 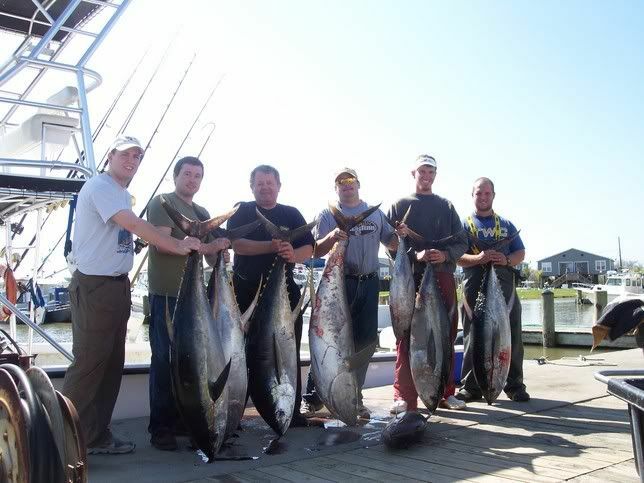 The biggest was 135 pounds and the rest were right behind him. we were chumming with threadfins today as opposed to pogies. Caught all fish on 80 pound mono leader and a 7/0 blue frenzy circle hook.